May | 2014 | Teemo, Ltd. This is an interesting concept but sometimes it really feels like we take two steps forward and one step back in this industry. Our greatest strengths — measurability, laser-targeting, accountability — are also our greatest weaknesses. “We can now report back to a client and say ‘we served you a thousand ads, and of those, 500 were seen for one second, 250 were seen for 10 seconds and 250 were seen for 30 seconds,” Slade went on. “The next obvious step is to sell blocks of time. “We can sell a thousand hours of exposure to a chief executive audience in Germany, for example, or we can give clients 500 hours of exposure to finance directors in Belgium. That currency has a lot of merit. via Financial Times kicks off trials to sell advertisers ‘blocks of time’ to tackle industry’s viewability issue | The Drum. All the noise around the RocketFuel and Mercedes-Benz fraud issue may be just that — noise but the problem of online ad fraud, particularly in relation to RTB and programmatic trading, isn’t going anywhere anytime soon. "Decipticons" can spoof your lookalike targeting. One of the reasons I’m so excited to be working the ridiculously clever team at Pixalate is that they saw this issue coming from a mile away. They were building solutions to help buyers and sellers combat the effects of fraud before all the hype. In a way, they were fraud-fighting hipsters, battling the bots before it was cool. Jalal Nasir, co-founder and CEO of Pixalate, has a great piece, complete with some very funny terms for the types of Fraud his platform can detect, in this week’s ExchangeWire. The Truth About Online Ad Fraud | ExchangeWire.com. If you’d like to talk to me about Pixalate, I’m their exclusive representative in Europe. Either drop me an email, grab at Digiday’s EU Publisher Summit in Barcelona. Programmatic Creative – Where are the Drapers to our Harry Cranes? Over the last two weeks I’ve been doing a ton of research online about the state and future of Programmatic Ad Buying. For sure there are a ton of tech prognosticators out there talking about optimised algorithms, probabilistic multi-screen story telling (dibs on the band name), conquering the In App challenge, integrating 3rd and 1st party data into decision engines, and more. Yet, not one article I’ve come across has discussed the importance of the creative itself. This is a consistent issue in our industry: we are so enamoured with our own tech and math genius, we often overlook the emotional quotient in advertising. We talk a big game about getting the right ad to the right person on the… etc. etc. but we never talk about getting ‘the most beautiful ad’ or the most ‘compelling ad’ or really anything else to with the quality of the creative itself. 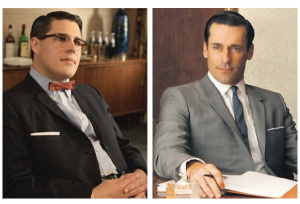 For those of you who watch Mad Men, it’s as if we’re all Harry Cranes and none of us are Peggys or Dons or Teds. Imagine if Mad Men was just about Harry. 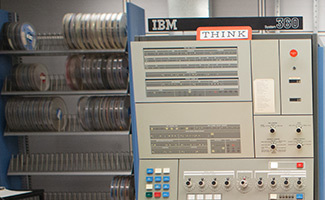 I’m reminded of a classic Roger Sterling line from the most recent episode: “Cutler won’t be happy until this agency is just Harry Crane and his computer.” It only now struck me how heavily we have bet on the numbers, leaving the creative and the quality of the message behind for someone else to worry about. I searched for some thought pieces on the state of programmatic creative and it’s pretty slim pickings. This piece, from AdExchange, though, I thought was a good start. The new breed of ‘Math Men’ need a new breed of creative lead to really succeed. A marketer who chooses to could employ a strategy of “right message to the right person at the right time on the right device on the right operating system at the right geofenced location during the right weather conditions …” In other words, the possibilities of highly relevant, “context-aware” advertising have never been greater. And yet, a one-size-fits-all creative strategy largely reigns supreme. via It’s Time To Fix Programmatic Creative – AdExchanger: News and Views on Data-Driven Digital Advertising. Granted, this piece is authored by someone with some skin in the game (and, full disclosure, so do I) but still, some compelling stats. Paid content as engaging (on a click basis) if not more than ‘straight’ editorial. Just because it’s paid for doesn’t mean it isn’t good. I mean, just look at the Lego Movie for the ultimate example of this. A United Airlines interactive graphic—produced in partnership with The Times—that showed how far athletes traveled to compete at Sochi. The result was nearly 200,000 clicks—well above the average editorial article. Great News For Native: The New York Times’ Sponsored Content Is As Popular As Its Editorial | The Content Strategist, by Contently. I think we are only beginning to see the tip of the content & native advertising backlash. It’s going to be a rocky road ahead for publishers, advertisers, and tech. MediaPost Publications When Is An Ad An Ad? Only Time Will Tell 05/27/2014. This is an excellent primer from VentureBeat on not just “Native” but also on the fledgling world of native exchanges. The development and adoption of native marketplaces will lead the way for delivering native solutions at scale. The exchanges will make it easier for editors to maintain control over what appears on their sites and for advertisers and brands to operate with transparency and the knowledge that their brand will only be run alongside AAA content. Native exchanges abide by the same biddable auction structure, but the inventory being bid on is one of the newly recognised native ad formats, such as an in-feed ad or recommendation widget. 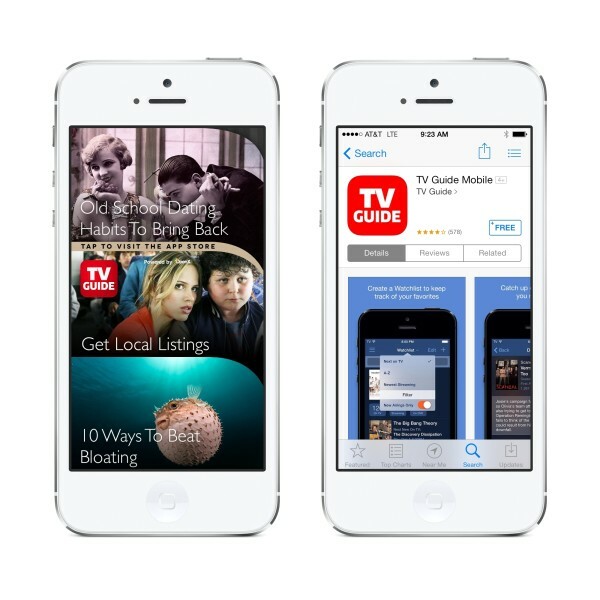 The key benefit of these new native formats is that they are placed where audiences are already actively looking for content; a study from IPG Media Labs showed that audiences look at native ads 53 percent more frequently than display ads. What you need to know about the brand-new native ad exchanges | VentureBeat | Marketing | by Chris Schreiber, Sharethrough. Since I recently read in the WSJ that only 23% of CMOs both “understand what online programmatic is and use it in their marketing strategy” I think that this AdAge report would be a useful thing to read and share with the CMO in your life. 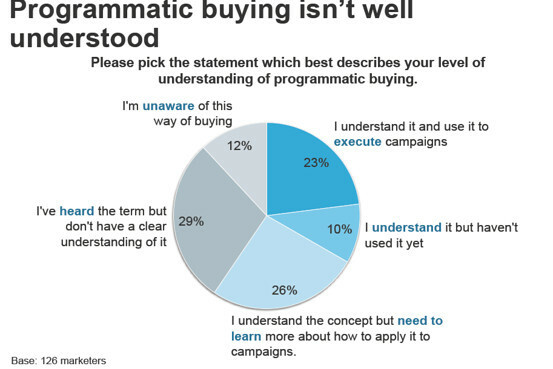 The CMO’s Guide to Programmatic Buying | Digital – Advertising Age.